Author Ilse Sand, from Denmark, is a former parish priest who currently works as a supervisor, speaker, trainer, and therapist. In 2010, she wrote the best-selling book Highly Sensitive People in an Insensitive World: How to Create a Happy Life. 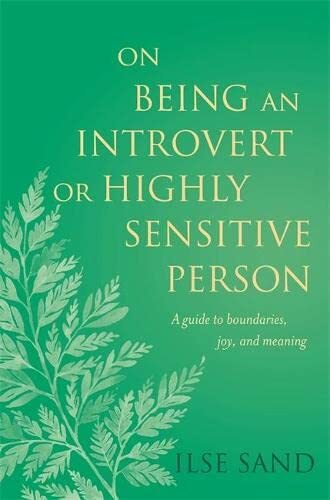 In her preface to the current volume, Sand explains that her first book led her to hear about the challenges others face, to provide advice, and ultimately, to gain new personal insights, all of which form the foundation for her current work, On Being an Introvert or Highly Sensitive Person. Sand opens with a brief overview of the development of personality types. She cites the work of psychiatrist Carl Jung in the early part of the last century along with Elaine Aron, a psychologist who first described the highly sensitive character trait. Sand provides brief examples for determining one's introversion and high sensitivity, although she refers the reader to the "Test Yourself" section at the end of the book. The remainder of the book revolves around providing practical recommendations for those who fit into these categories. Weaving in her own personal experiences as well as anecdotes from others, Sand offers what often seems like common-sense information. For example, there is a chapter on how introverts/high sensitive people do best by avoiding overstimulation, and so some of Sand's simple suggestions include using ear plugs/ear buds and engaging in routine activities. Many of the chapters are quite short—Sand address "Limit Your Catastrophic Thinking" in just over four pages. She is not at all reticent to tell readers exactly what she thinks is best for them, as in "I would recommend that, for your own good, you seek out face-to-face interaction every day" (p. 69). Somewhat more helpful is the chapter on resolving conflicts: here Sand normalizes the emotional experience of introverts/high sensitive people and validates the use of less direct strategies (i.e., not face-to-face) for confrontations. As a clinical psychologist, I learned little from this short read, and yet I still found it engaging, especially from more of an insider's perspective. The tests to determine whether one is an introvert/high sensitive person were different from the classic assessment tools I have utilized in the past; with how the items were scaled, I came out in the middle for both qualities (although slightly weighted towards being both introverted and high sensitive, which is probably correct). I think that this book would appeal most to those who not only could relate directly to the author's experiences but also who have felt alienated by a more extroverted leaning world. That particular cohort is like to find On Being an Introvert or Highly Sensitive Person extremely affirming, and perhaps even illuminating.